Tetsu Trudge is a Security officer who observes the residents of Satellite. He initially duels using a “Guard” deck, but after his first clash with Yusei, he upgrades to a specially-designed “Pursuit” deck, with Goyo Guardian as its main Synchro of choice. He has a violent character but also great pride as a duelist and for this Yusei respects him. After losing to Yusei, he vows to defeat and arrest him, no matter how long it takes. After the first confrontation between Yusei and the Dark Signers, Trudge falls under their control, becoming a Dark Signer himself, and challenges Jack to a duel while the latter is still recovering from his Fortune Cup finals match against Yusei, using a Worm-based deck that focuses on Deck Destruction. Just like the other brainwashed Dark Signers, Trudge gets back to normal after being defeated by Jack. He later reappears to help Mina spy on Jack and brings the signers to Martha’s place where he develops a deeper respect to the people of Satellite. He has also shown to have a crush on Mina, and is incredibly jealous of Jack to the point he gains super strength. As time goes on, he becomes less hateful and shows more concern for his allies. Following the Dark Signer incident, he becomes Mina’s partner in an Investigation unit. He is also an examiner who tests those looking to acquire a license for Riding Duels. 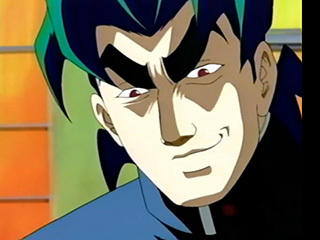 His character is based on Ushio, to whom Yugi Muto challenged his first Shadow Game. In the dubbed version, Trudge has a rivalry with Yusei going for some time now. 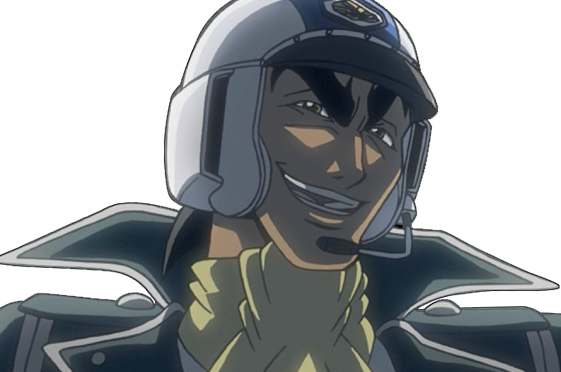 The pilot dub shown at Comic-Con referred to him by his Japanese name, Ushio, rather than Trudge. In Yu-Gi-Oh! 5D’s: Wheelie Breakers, his full English name is Officer Tetsu Trudge. After some time had past, Trudge continues his work with Security along with Mina, and is promoted to Chief. He investigates the mysterious attacks by Ghost, informing Yusei, Jack and Crow and asking them for their assistance though Crow quickly declines. After some thought Trudge decides that it was wrong to try and place civilians in danger, so he decides to take matters into his own hands. Later, he encounters Ghost and engages in a Turbo Duel. Confident he would win, he quickly summons his strongest monster, Goyo Guardian, until he fell against Ghost’s Machine Emperor Wisel who absorbed his synchro monster and defeating him. Due to the impact, Trudge became severely injured and hospitalized. As he is wheeled into the operation room, he gives Yusei a warning to not use Synchros against Ghost. Tetsu Trudge later acts as a Duel Runner instructor, and Turbo Duels against Akiza Izinski, as she attempts to obtain her license. Here he purposely plays dirty and rough on her, probably to teach her how to handle herself in an actual Turbo duel. At first he seemed to take the lead, destroying Akiza’s ace monster, “Black Rose Dragon” early on, but lost when Akiza made a comeback. Trudge first plays a Guard Deck themed around his occupation as a security officer. He uses security-related cards such as “Handcuffs Dragon” and “Wiretap” to limit what his opponent is able to do. He also carries a trump card in the form of “Montage Dragon,” which he can bring out as a heavy hitter if the aforementioned strategy fails. As seen in several flashbacks, where Security officers use Montage Dragon and Assault Dog (seperate flashbacks), it can be assumed every Security officer got this deck. Trudge received a new deck from the Bureau for a rematch with Yusei. This deck is a Pursuit Deck relating to his goal of blocking the pipeline so Yusei cannot get through. Its prominent cards include “Gate Blocker,” which stops the opponent from using “Speed World,” and “Gonogo” which automatically flips the monster it’s battling into face-down Defense Position. His strongest card is “Goyo Guardian,” which can resurrect the monsters it destroys as defenders for Trudge. This type of deck is also commonly used by other Security officers. They probably got their deck changed at the same Trudge got the new deck. As a Dark Signer, Trudge’s Deck became a Mill Deck that uses “Worm” monsters and the powerful Dark Synchro Monster “Dark Diviner” whose effect can not only mill his opponent’s deck, but render itself and its user almost invincible. During the Third Season, in his duel against Ghost his deck appears to be the same, though in his duel against Aki during the license exam his deck has changed into a “Hellway” deck that utilizes cards that can damage, overpower and lock his opponents.